The aim of Faith and Fire is to develop mutual respect, and to increase Fire and Rescue Service awareness of different faiths. Faith and Fire was founded in 2013 by Fire Officer Daryl Oprey (the then CFOA Chief Fire Officers Association Lead on Equality and Inclusion). and Jacquetta Gomes Bodhicarini Upasika Jayasili (his then Advisor on Interfaith and Multifaith). The venture developed from work undertaken in 2012 by Fire Officer Oprey with BGKT Buddhist Group of Kendal (Theravada), Ketumati Buddhist Vihara Manchester, and MBC Manchester Buddhist Convention. The WCF World Congress of Faiths supports Faith and Fire and is represented on the Faith and Fire Steering Group alongside faith leaders and several Fire and Rescue Services. The Faith and Fire website offers information on topics, including chaplaincy, death and dying, interfaith, and mindfulness. 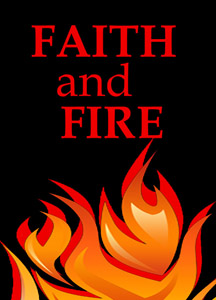 Faith and Fire welcomes relevant submissions for the website. The 2012, 2013, 2014 and 2015 Manchester Buddhist Conventions included sessions on Faith and Fire. Venerable Piyatissa explained how mindfulness can be developed to help all the parties (firefighters and victims) to face and overcome difficult emergency situations. Faith and Fire hopes to present a session at the 2016 MBC. LFB London Fire Brigade The first known Buddhist Fire Chaplain in the UK is Burmese Theravada Buddhist Monk Venerable U Uttara who served as a Buddhist Fire Chaplain to LFB London Fire Brigade. ESFRS East Sussex Fire and Rescue Service ESFRS East Sussex Fire and Rescue Service England, UK, appointed 2 Buddhists as Fire Chaplains. Venerable Pidiville Piyatissa as the Buddhist Chaplain, and Jacquetta Gomes Bodhicarini Upasika Jayasili as the Buddhist and Multifaith Chaplain in February 2014. 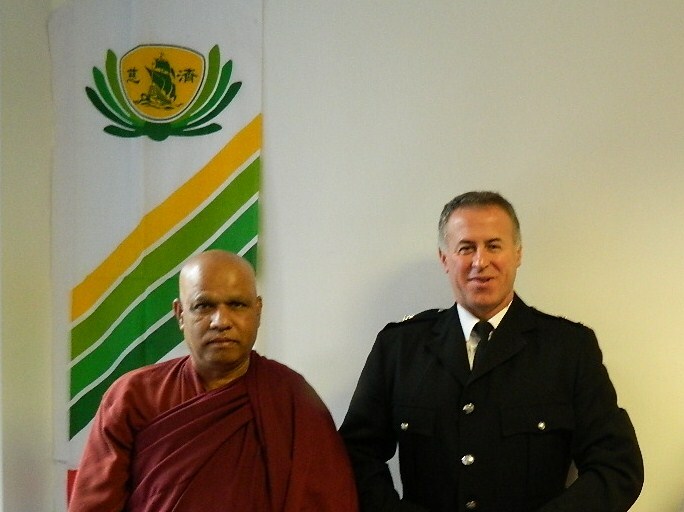 SF&RS Staffordshire Fire and Rescue Service appointed 3 Buddhists as Fire Chaplains: Venerable Pidiville Piyatissa Head of Ketumati Buddhist Vihara, Manchester, Venerable Galpottayaye Pemananda Ketumati Buddhist Vihara Manchester, and Jacquetta Gomes Bodhicarini Upasika Jayasili BGKT Buddhist Group of Kendal (Theravada), in 2015. The Fire Fighters Charity The Fire Fighters Charity multi-faith chaplaincy was launched during Inter Faith Week on 18 November 2015 at Jubilee House near Penrith in Cumbria, which is the charity’s first centre to introduce multi-faith chaplaincy support. The first Chaplain is Jacquetta Gomes. Danny Fisher states on page 151 “Rev. [Alan] Urasaki … appears to be the only Buddhist Fire Chaplain in the country [USA]: in 2004 he was appointed as a volunteer Chaplain with the Honolulu Fire Department”. BEWES Buddhists Engaged with Emergency Services is an informal network of Buddhists, working with or who have worked with, the emergency services [Fire, Police, and Ambulance]. Venerable Piyatissa and Daryl Oprey at MBC 2013.